What's best for YOU - Choosing a bridal metal that will last a lifetime. Why is Platinum The Most Precious? Quite simply, platinum is one of the earth's rarest elements. Its naturally white color will not oxidize or decay over time. Scarcity makes platinum highly prized, but its demanding nature also means that only the most skilled artisans can work with it. A single ounce of platinum not only requires exceptional effort to mine and refine, it involves weeks of expert handling to craft into a piece of jewelry. ...YELLOW GOLD if you prefer a yellow color metal surrounding your diamond. ...WHITE GOLD if you prefer white color and don't mind a ring that may lose its whiteness over time or due to wear. ...PALLADIUM for a silvery white color that lasts, but is less treasured than platinum. There are eight factors you should consider when you are deciding on the metal for your bridal jewelry. This is the basic worth of a metal. Prices of all metals fluctuate according to supply in the market and demand by consumers. The more pure and precious a metal, the more limited its availability tends to be. Scarcity drives demand, making a metal like platinum more likely to maintain its intrinsic value over time. In addition to a metal’s ability to withstand wear and tear, life span is judged by certain practicalities. Platinum is highly durable and platinum jewelry can last for generations. Tungsten is also a highly durable metal, however, it’s not considered a precious metal, and tungsten rings cannot be resized. 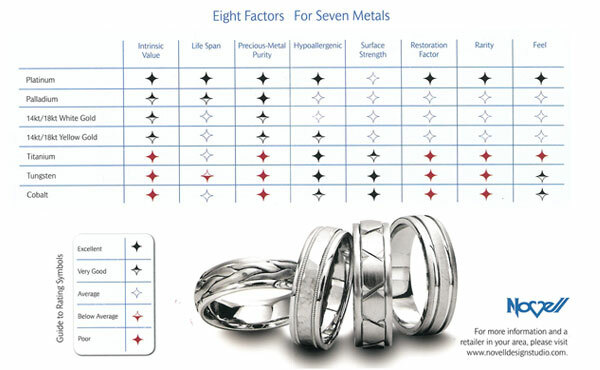 How much precious metal content does your ring actually have? 14kt gold is a mix of 58% pure gold and 42% non-precious metal. 18kt gold is 75% pure. Platinum and palladium, both precious metals, are at least 90-95% pure. Tungsten and titanium are also 90-95% pure, but are not considered precious metals. Hypoallergenic metals reduce or minimize the possibility of an allergic response by minimizing potentially irritating substances. Platinum is the only truly hypoallergenic precious metal. How much metal (and consequently value) will a ring lose to scratching and denting? All metals scratch, but with gold that scratch actually removes a sliver of metal. With platinum, scratching just ripples the surface. The displaced metal can be moved back into place by polishing. Can your ring be made to look new again? Can it be refinished, re-sized, or re-conditioned easily? Platinum performs beautifully in each case. Something that can’t be said for the other metals. supplies of both platinum and palladium are very limited, platinum is utilized in far more ways than palladium. Platinum is 30 times more rare than gold. And the greater demand from medical and industrial interests, on an already smaller supply, makes platinum more highly prized. For many, the feeling a metal has on their finger is important. Platinum is twice as heavy as palladium, 60% heavier than 14kt gold, and 40% heavier than 18kt gold. In addition to a significant feeling, this weight, due to platinum’s density, is also part of what makes platinum an extremely durable metal.